with a rain date of Sunday, June 9th, 2019. EXPO 2019, our celebration of creativity, culture and community! For inquiries, please call Deborah Woodbridge @917-539-2559, 9am – 9pm. The NYC DOT has many opportunities for artists. See their website for additional calls for art & artists. Bounce by Brittany Baldwin. Presented with New York Cares. Queens Boulevard between Woodhaven Boulevard and 59th Avenue, Queens. 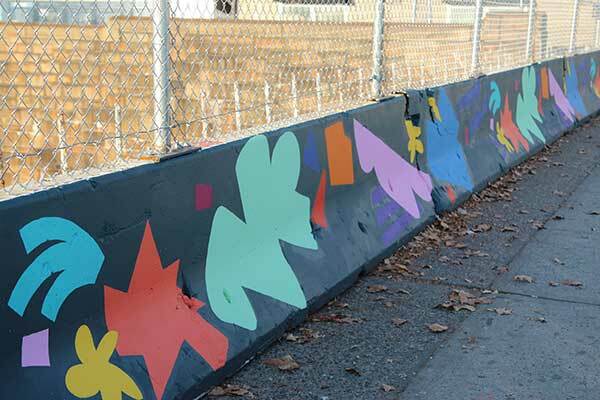 DOT Art collaborates with New York Cares to beautify concrete barriers with bold, colorful murals that are designed by professional artists but painted almost entirely by volunteers. Barriers located along protected bike lanes or active sidewalks become canvases for art. DOT Art provides selected artists with a design honorarium of $2,500 and a materials fee of $500 for stencil production. DOT Art and NY Cares provide paint and associated materials at no cost to the artist. NY Cares coordinates volunteer recruitment and secures volunteers to implement the mural on a single day in fall and spring. Murals remain installed for 11 months. This entry was posted in Calls for Artists, Looking for Artists, Opportunities. Bookmark the permalink.